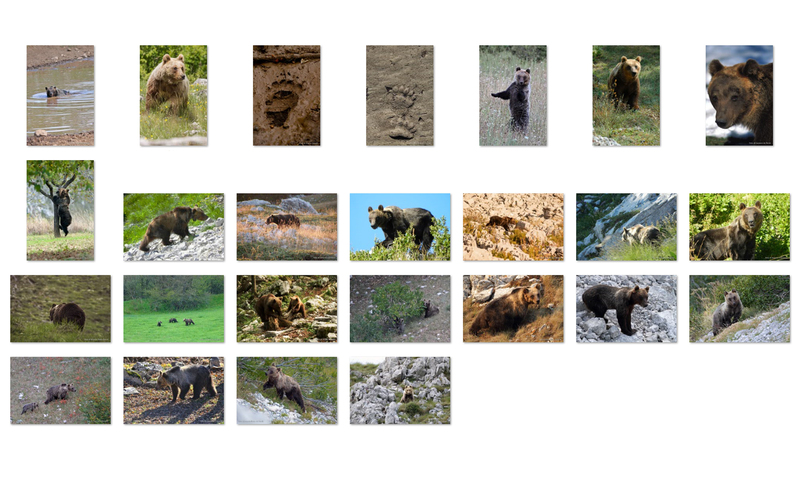 “Marsican Brown Bear Life Snapshots” is an itinerant photo exhibition, inaugurated on June 4, 2017 at the Gole del Sagittario Regional Nature Reserve and WWF Sanctuary on the occasion of the event “A slow step… among the treasures of the Bear” organized by Salviamo l’Orso and sponsored by Abruzzo Open Day Summer. The bear is a charismatic animal. Seeing it always (or the most of the times) arouses positive emotions and feelings, but seeing it in nature is not easy and certainly it is not advisable to “go look for it”, so as not to disturb it. To ensure that people do not miss this pleasant encounter, we have been entrusted with photo-explorers, bear friends, who have spent hours and hours walking on arduous paths, loaded with their heavy equipment, and long silent hides, camouflaged in the landscape, to minimize disturbance and to have the best conditions for capturing our Apennine bear. Of course, some shots have been the result of a fortuitous encounter, but the generosity of this animal always pays off those who can appreciate it. An itinerant exhibition allows us to communicate in different places and on every good occasion the importance of protecting what we call “The Bear Lands” – protected areas and not, which see the more or less constant presence of the bear. There are numerous projects that Salviamo l’Orso is carrying on, also in collaboration with competent institutions, in order to monitor these territories, to detect any traces and signs of the bear’s presence, and to act practically, thanks to the work of many volunteers, in order to prevent human-bear conflicts, engaging in creating the best social conditions to foster peaceful coexistence with this animal. These shots want to celebrate an animal we love and that we would like to continue to see roaming free in our mountains. An emotion we want to pass onto the generations to come! For this reason, we have committed ourselves to the conservation of this species alongside all those subjects who, as well as us, see in the Marsican brown bear either a material value, as, as is well known, its existence guarantees the ecological balance of the ecosystems to which it belongs, or an immaterial value, which is made up of symbols, hopes, identities and reflections, proper to the life of each of us and projected there, in those wild places inhabited by the bear. Special thanks to our generous photographers: Angelina Iannarelli, Andrea Benvenuti, Marco Novelli, Francesco Culicelli, Gaetano de Persiis, Giancarlo Mancori, Antonio Liberatore, Rinaldo Delle Donne, Gianpiero Cutolo, Massimiliano de Persiis, Massimo Re Calegari. Please follow Salviamo l’Orso to get to know the upcoming appointments of our itinerant photo exhibition.